But the assistant demon assigned to the case has his suspicions, because the philosopher is Saloninus—the greatest philosopher, yes, but also the greatest liar, trickster and cheat the world has yet known; the sort of man even the Father of Lies can’t trust. 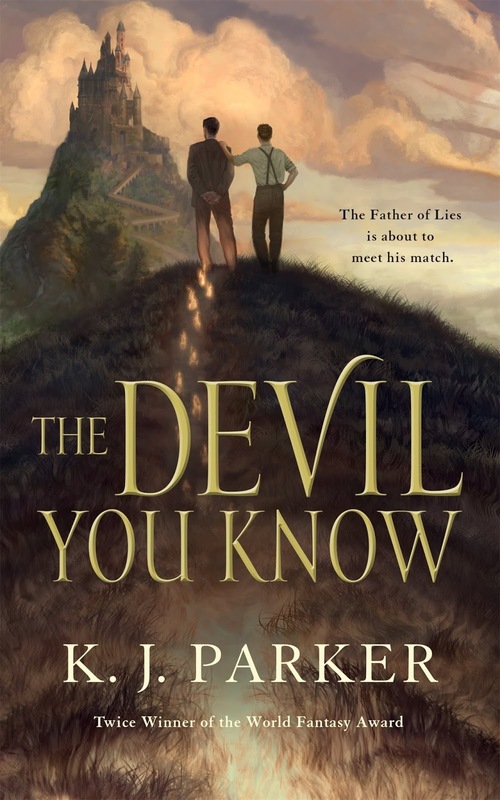 If there's one thing you can say with certainty about the work of K. J. Parker, it's that there's always more to it than meets the eye, so the fact that the personage of K. J. Parker hid a similar mystery made more than a modicum of sense. Who was he really? What might his use of a pseudonym mean? Was he even a he? For a decade these questions played a part in damn near every discussion of the aforementioned author, and factored, furthermore, into the mystique surrounding everything he'd written in addition. Then, late last April, the big secret was revealed: K. J. Parker was indeed a he, and his alter ego was Tom Holt. Of course. In the wake of the stories surrounding the announcement, I found myself wondering whether we might not have lost some of the patented K. J. Parker magic in the course of getting to know the unknown. Well, if The Devil You Know is anything to go on, the answer to that question is a resounding no. After the small wonder that was The Last Witness, a taut tale about a gambler who bets on memories, an equally brief book about a business transaction sounded, I'll say, decidedly less exciting. But things get very interesting very quickly, because the deal that sets this subversive story in motion is between a famous philosopher known as Salonius and—well... the devil. Or at least his employee of the year. But for some, money is not enough—and so to The Devil You Know, which stars a Salonius approaching the end of his life with what he says is his single greatest ambition still unfulfilled. His appeal to the Powers That Be for a mite more time inspires a swathe of suspicions in the demon dispatched to discuss terms with said, but with the immortal soul of such a significant figure on offer, the deal is done with just a little dickering. When his charge begins behaving strangely, Salonius' so-called case officer's earlier concerns reemerge. The erstwhile alchemist invades a country—whether for power, prestige or because "years ago a Mysian kicked sand in his face on a beach somewhere [...] you just don't know" (p.48)—then sets about bringing his dead wife back to life. But hang on a cotton-pickin' minute; he didn't even like her! Our demon just doesn't understand—which goes some way towards making him the more relatable of The Devil You Know's pair of narrators. Repeated reflections on his "God-given" (p.75) gift for keeping secrets make Salonius himself seem smug and superior; his case officer, on the other hand, is an actual agent of evil, but at least he's decent. For a demon. Confusing this issue still further is the fact that both of the aforementioned perspectives are explicated in the first-person, without even a twist in tense to differentiate them. By design, I dare say, this decision is likely to leave some readers feeling frustrated, but as with anything Parker has a hand in, there's a method behind the apparent madness, and in this instance, the method is seemingly meaningful, and finally fulfilling. This is K. J. Parker's gift: the ability to tell one story while seeming to tell another—and it's as satisfying here as it's ever been. BROTHERHOOD OF ILLUMINATI Easy way to join the Illuminati brotherhood in the world. Are you a business man or woman,an artist,Politicians,pastor, and you want to become big, Powerful and famous in the world, join us to become one of our official member today.you shall be given an ideal chance to visit the Satan. or you are from a poor background, and you really want to be famous in life.or do you want to become very rich in life, this is the chance for you to become rich and eradicate poverty from your life, the illuminati want to use this to help the poor and also to make people famous in life, if you are really ready to become a member of the illuminati temple than contact Mr JOHN.Via EMAIL..illuminatilordmater@gmail.comso that we can make your dream come through. i want to promise you that you will not regret this so i want you to join us now and live a very happy life. or call us on +2348164074840 for more information..